Hell yeah, baby, the next phase in inevitable Knicks drama has begun. 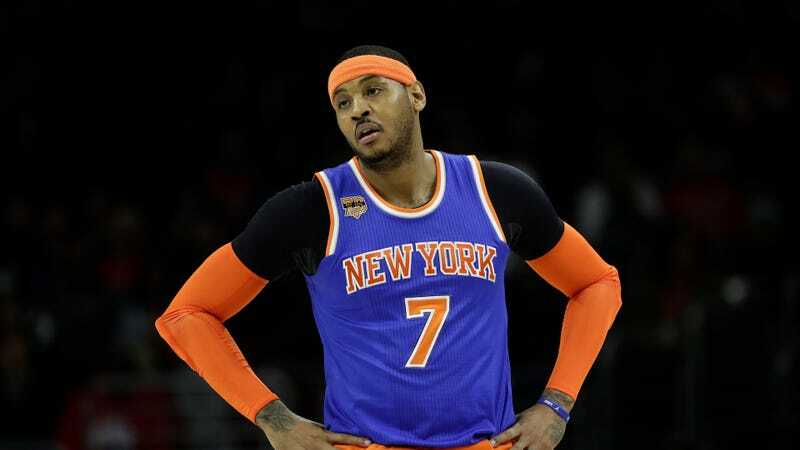 It’s now once again time to start speculating about Carmelo Anthony’s future in New York. Carmelo Anthony’s legs are going, going, almost gone. As ever, he’s still a dangerous scorer but resists any offensive game plan that limits his one-on-one adventures. Moreover, his sticky fingers causes whatever ball-and-player movement is in effect to come to a grinding stop. It’s easy to write that off as a replacement-level basketball take, but given Rosen’s tight relationship with Jackson, it’s not hard to read those words as belonging to Jackson rather than Rosen. This is the possibility that was posed to Anthony after last night’s game, and given his response—his use of “that side” pretty clearly places Rosen and Jackson as co-conspirators—it’s an assumption he seems comfortable making. The Post reached out to Rosen, who assured them that his piece contained only his opinions, but I think it’s safe to assume that Anthony and Jackson have a few difficult conversations ahead of them. Despite how Jackson or Anthony may really feel, the obstacles standing in the way of Anthony exiting New York are of the practical variety. Anthony is 33, has a huge contract that runs for two more seasons, and wields a no-trade clause. Finding a suitor that is approved by Anthony (the Clippers?) and willing to take on his contract and deficiencies as a player would be a difficult task. It’s very likely that Anthony and the Knicks are stuck with each other, and one wonder why Jackson would use his favorite mouthpiece to start shoving Anthony toward the door and risk sowing further discontent if he knows a trade is unlikely. The simple answer is that Jackson had nothing to with Rosen’s piece. If you’ll allow me to affix my tinfoil hat for a brief moment, I’ll offer another possibility: The more people are focused on Anthony and his struggles to remain a superstar, the less focused they are on Jackson’s inability to build a winning a team around his franchise player.